Ziegner distinguished himself by exposing himself to the fire of the Indians and volunteering to go to the support of Capt. Varnum, and there again attracting attention by his coolness and gallantry. Private Herman Ziegner was a twenty-six-year-old German immigrant with less than six months remaining on his five-year enlistment when he arrived with Captain Charles S. Ilsley’s E Troop at the cavalry camp at the Wounded Knee Post Office on 28 December 1890. His actions during the next two days’ fighting caught the attention of his officers and resulted in his being awarded the Medal of Honor. Like all of the soldiers in E Troop that were recognized with honorable mention, Private Ziegner’s conspicuous actions at Wounded Knee likely took place on the unit’s skirmish line while attempting to dislodge the Lakota warriors from a pocket in the dry ravine. The troop’s second lieutenant, Sedgwick Rice, singled Ziegner out for award of a medal. Lost in the Nation’s archives is Rice’s original letter. All that remains of the Ziegner recommendation among the stacks of correspondence dealing with award submissions from Wounded Knee, is a summation by the Adjutant General’s Office concerning five soldiers from E Troop. The letter makes no mention of Ziegner at the ravine but does state that he exposed himself to the fire of the Lakota. Rice apparently recommended Ziegner for both Wounded Knee and White Clay Creek, as the summation mentions Ziegner volunteering to go to the assistance of Captain Charles A. Varnum, commander of B Troop, whose actions on 30 December also merited a Medal of Honor. Ziegner was the only soldier awarded a Medal of Honor for actions in both battles. 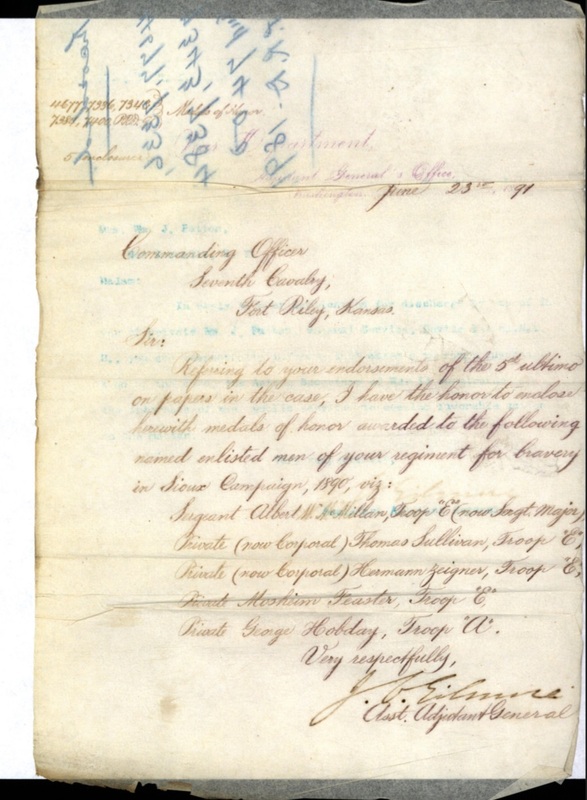 Lieutenants Sickel and Rice compiled recommendations for soldiers from E Troop toward the end of March 1891 and submitted them to the regimental adjutant for endorsement and processing. Captain Ilsley and Colonel J. W. Forsyth were both absent from the post at that time. After conferring with Major S. M. Whitside, who was commanding the regiment and the post in Forsyth’s absence, First Lieutenant L. S. McCormick as adjutant endorsed the submissions on behalf of the regiment’s colonel. The recommendations for Sergeants John F. Tritle, William G. Austin, and Albert W. McMillan, and Privates Thomas Sullivan, Mosheim Feaster, and Herman Ziegner were all returned to the regiment in early April by the Adjutant General’s Office in order for Ilsley and Forsyth to endorse the submissions. (Click to enlarge) Four of the E Troop Medals of Honor were approved on 23 June 1891 and mailed to the regiment for presentation along with one medal for a soldier from A Troop. After obtaining the necessary endorsements, each of the recommendations received due consideration at the War Department. Four of the six awards were approved on 23 June, including the Certificate of Merit for Sergeant Tritle. As was the custom of the day, the medals were mailed to the regimental commander where they could be conferred in an official ceremony at Fort Riley. Born about 1864 in the town of Apolda in what was then the Duchy of Saxe-Weimar-Eisenach in the German Confederation, Hermann, as his name was sometimes spelled, was the son of Hugo Ziegner and Lena Hoene. By 1886 Ziegner had emigrated from Germany and was residing in Baltimore, Maryland. According to the 1885 Baltimore City Directory, there were only two Ziegners, Alfred and Joseph, living in the city, both at 702 Saratoga Street, the former a barber and the latter a blacksmith. Perhaps they were relatives of young Herman Ziegner, who enlisted in the Army at Baltimore on 21 May 1886. Captain Parke, his recruiting officer, recorded that Ziegner had worked as a hostler, that the twenty-two-year-old stood five feet, ten inches in height, and had brown eyes, black hair, and a dark complexion. During his tenure in the 7th Cavalry, Ziegner also served in troops L and I, and completed his five years of service as a corporal in E Troop with a characterization of service of ‘excellent’ just a month before receiving the Medal of Honor. Ziegner reenlisted the following day for another five-year term. 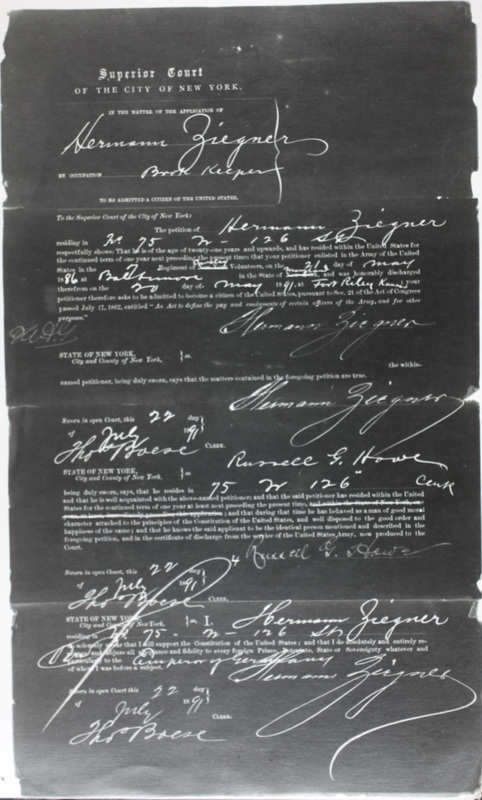 (Click to enlarge) Hermann Ziegner applied for naturalization on 22 July 1891 stating that he resided at 75 West 126th Street where he was employed as a book Keeper. Two months after reenlisting and a month after receiving his medal Ziegner applied for naturalization in New York City. He used his honorable discharge from his first enlistment as the basis for becoming an American citizen. Ziegner indicated that he was a book keeper residing in the city and gave the same address as that of his witness, Russell G. Howe. Stationed briefly at Fort Sheridan, Illinois, as a sergeant in Troop I, Ziegner completed his service at Fort Riley, Kansas. In 1894, he left the Army early under an 1890 law that granted soldiers ninety days of furlough upon completion of three years with the option of terminating their enlistment at the end of the leave. Based on his eight years of service Ziegner took six months of leave in February of that year and established himself in Manhattan at 326 West 126th Street, just two blocks from the residence he provided on his naturalization application three years earlier. He applied for a position on the New York City Police Department but ultimately ended up working as a clerk. On 16 December 1894 Ziegner married Margaret Kenard, a twenty-nine-year-old Irish immigrant. Born in Tipperary she was the daughter of Patrick Kenard and Johanna Dooley, who came to America when Margaret was a toddler. She was the eldest of four children; her siblings, Maria and Martin, were born in Ireland, and the youngest, Agnes, was born in New York. 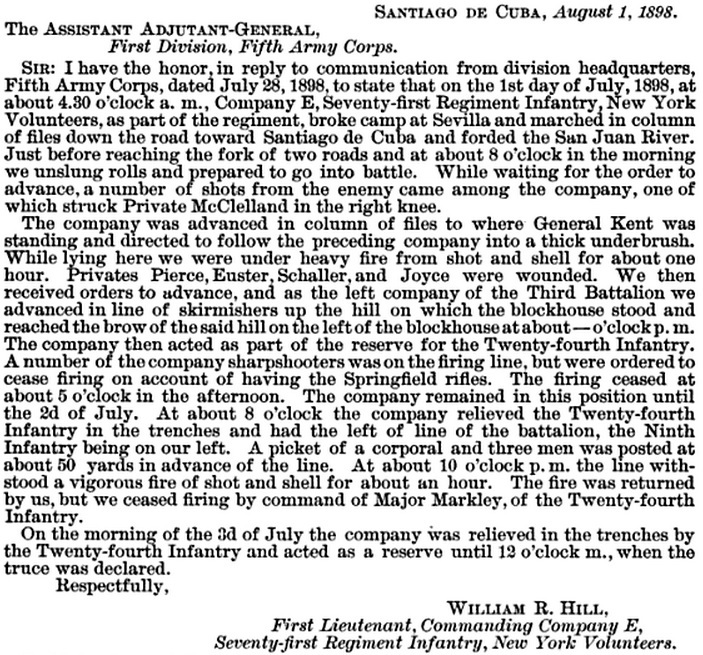 (Click to enlarge) First Lieutenant William R. Hill’s report of Company E’s actions at Santiago, Cuba, in July 1898. At the onset of war with Spain in April 1898, Ziegner was working as a night watchman at the Equitable Life Assurance Building in Manhattan. He was one of the first volunteers to sign up and served as the first sergeant of Company E, 71st New York Infantry. Under the command of First Lieutenant William R. Hill, the unit saw action at San Juan Hill on 1 July and the siege of Santiago, Cuba, from 2 through 17 July 1898. The regiment suffered twelve men killed in action and three that died of wounds. Lieutenant Hill rendered a report to the adjutant general of the First Division wherein he mentioned by name the wounding of five men in Company E. More devastating were the regiment’s losses from disease. Eight men died of Typhoid fever, including one officer, twenty-six succumbed to malaria, and another twenty-five died of fevers or intermittent fever, not to mention other maladies. In all the regiment lost eighty-six men to disease and non-battle related injuries, almost one hundred deaths in all. 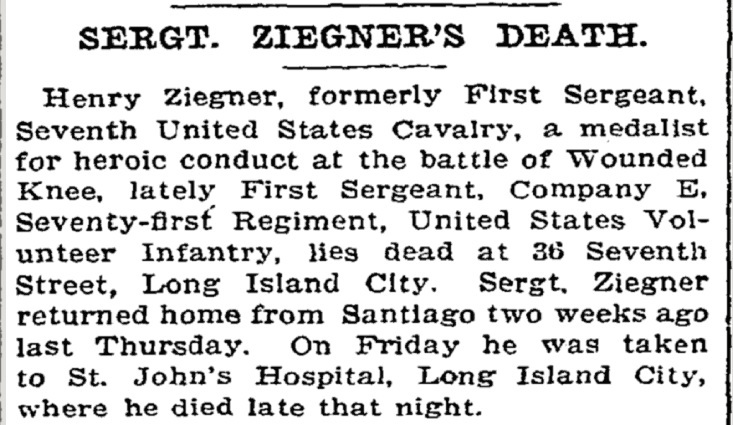 Sergeant Ziegner’s death was run in several New York Newspapers. Due to the overcrowding, some soldiers where able to return to their homes for care. 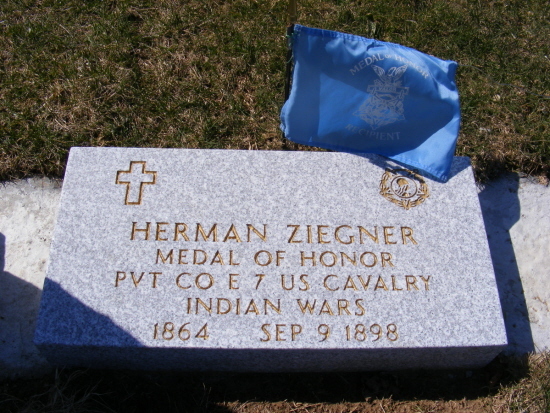 By the time First Sergeant Herman Ziegner made it home he was too far gone; he died on 9 September 1898. His story ran in several of the city’s newspapers. The article in the New York Times detailed the plight of Ziegner and his now destitute wife. “My husband was starved to death. Think of it, for eight years he was in the service of the United States Army, and fought at Santiago, leading Company E up San Juan Hill, side by side with Company F and Capt. Rafferty, his friend–and now,” she moaned, “in return for his bravery and courage this Government starves him to death. Ever since Sergt. Ziegner returned Dr. Frank E. Brennan of 76 East Avenue, knowing of Ziegner’s circumstances visited him daily, and would not take a cent for his services. Finally Ziegner became so weak that Dr. Brennan advised him to go to St. John’s Hospital, where he could receive better attention. There everything that was possible was done for him, but as Dr. Brennan said, his stomach and constitution had been wrecked, and no human agency could save him. According to Lieut. W. Hill of Company E, Seventy-first Regiment, there was no braver man in the company than Ziegner. The Sergeant was born in Weimar, Saxony, thirty seven years ago, and there his mother still lives. Sergt. Ziegner often spoke after his return to his wife, of the treatment he received after he was taken ill with malaria. He said that he could get nothing to eat except hardtack and bacon. He strongly asserted that he knew that if he could have had what he craved when first taken sick he would not have been in such a weakened condition. The funeral will be to-morrow afternoon at 3 o’clock, from SE Seventh Street, Long Island City. The Red Cross Society last week heard of the destitute circumstances of Mrs. Ziegner. Money and other aid was given her by Mrs. Cornell of the Red Cross Society. Perhaps to tug on readers’ heartstrings, one article mentioned that Mrs. Ziegner was pregnant with their first child when Sergeant Ziegner died. However, records indicate that she had no children. The sergeant was buried with military honors at the Calvary Cemetery in Woodside. Two weeks after his death, Margaret Ziegner applied for a pension. She was working as a dressmaker in 1900. Sergeant Herman Ziegner is buried in the Calvary Cemetery at Woodside, New York. William R. Pawson, “Death of a Hero: Sergeant Herman Ziegner, 7th U.S. Cavalry and 71st New York Volunteer Infantry,” Journal of the Orders and Medals Society of America (JOMSA) vol. 60, no. 2, March-April 2009, 26-32. Ancestry.com, U.S. Army, Register of Enlistments, 1798-1914 [database on-line] (Provo, UT, USA: Ancestry.com Operations Inc, 2007), Title : Baltimore, Maryland, City Directory, 1885, Image: 732; Ancestry.com, U.S. Army, Register of Enlistments, 1798-1914 [database on-line] (Provo, UT, USA: Ancestry.com Operations Inc, 2007), Year Range: 1885-1890, Surname Letter Range: L-Z, Image: 607, Line: 7. 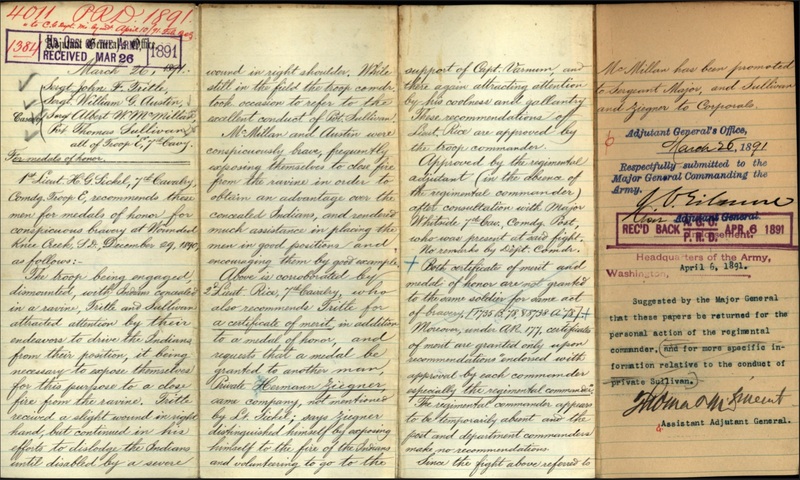 National Archives at New York City; Superior Court of the City of New York (468-470), ARC Number: 5324244; ARC Title: Petitions for Naturalization, 1793-1906, Record Group Title: Records of the Immigration and Naturalization Service, Record Group Number: 85. Ibid. ; U.S. Army, Register of Enlistments, 1798-1914,Year Range: 1891-1892, Surname Letter Range: A-Z, Image: 506, Line: 11; The New York Times, July 12, 1894. Ancestry.com, New York, New York, Marriage Index 1866-1937 [database on-line] (Provo, UT, USA: Ancestry.com Operations, Inc., 2014), Certificate Number: 169; Ancestry.com and The Church of Jesus Christ of Latter-day Saints. United States Federal Census [database on-line] (Provo, UT, USA: Ancestry.com Operations Inc, 2010), Year: 1880, Census Place: Queens, Queens, New York, Roll: 918, Family History Film: 1254918, Page: 9B, Enumeration District: 279, Image: 0502. War Department, Annual Report of the War Department for the Fiscal Year Ended June 30, 1898, Report of the Major General Commanding the Army (Washington: Government Printing Office, 1898), 309. Ibid., Adjutant General of New York, New York in the Spanish-American War, 1898, vol. 1 (Albany: J. B. Lyon Company, State Printers, 1902), 212 and 250. Associated Press, “Can’t Care for Sick Men,” The Sun (New York: 24 Aug 1898), 1. Associated Press, “Sergt. Ziegner’s Death,” New York Times (New York: 11 Sep 1898), 5. Pawson, “Death of a Hero,” JOMSA; National Archives and Records Administration, U.S., Civil War Pension Index: General Index to Pension Files, 1861-1934 [database on-line] (Provo, UT, USA: Ancestry.com Operations Inc, 2000), Roll number: T288_544; United States Federal Census, Year: 1900, Census Place: Manhattan, New York, New York, Roll: 1096, Page: 2A, Enumeration District: 0321, FHL microfilm: 1241096. Don Morfe, “Herman Ziegner,” FindAGrave (http://www.findagrave.com/cgi-bin/fg.cgi?page=gr&GRid=8221237), accessed 9 Dec 2014. 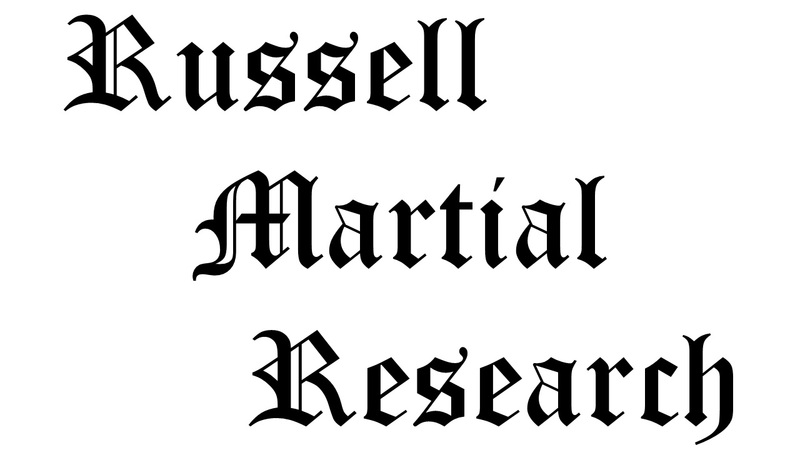 Citation for this article: Samuel L. Russell, “German Immigrant Private Herman Ziegner, E Troop, 7th Cavalry – Conspicuous Bravery,” Army at Wounded Knee (Sumter, SC: Russell Martial Research, 2013-2015, http://wp.me/p3NoJy-DH), posted 9 Dec 2014, accessed date __________. This entry was posted in Award Recipients, Enlisted and tagged 7th Cavalry, 7th Cavalry Regiment (United States), Battle of Wounded Knee, Big Foot, Cavalry Troop, Lakota, Medal of Honor, Sioux, Wounded Knee, Wounded Knee Creek, Wounded Knee Massacre. Bookmark the permalink.